One of the most complicated and ambiguous tendencies in contemporary western societies is the phenomenon referred to as the "turn to religion." In philosophy, one of the most original thinkers critically questioning this "turn" is Jean-Luc Nancy. 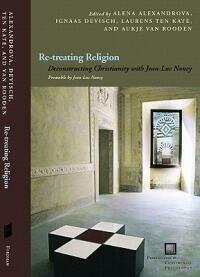 Re-treating Religion is the first volume to analyze his long-term project "The Deconstruction of Christianity," especially his major statement of it in Dis-Enclosure. Nancy conceives monotheistic religion and secularization not as opposite worldviews that succeed each other in time but rather as springing from the same history. This history consists in a paradoxical tendency to contest one's own foundations-whether God, truth, origin, humanity, or rationality-as well as to found itself on the void of this contestation. Nancy calls this unique combination of self-contestation and self-foundation the "self-deconstruction" of the Western world. The book includes discussion with Nancy himself, who contributes a substantial "Preamble" and a concluding dialogue with the volume editors. The contributions follow Nancy in tracing the complexities of Western culture back to the persistent legacy of monotheism, in order to illuminate the tensions and uncertainties we face in the twenty-first century.